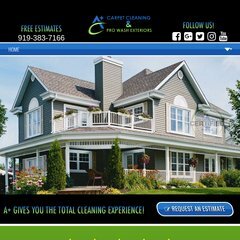 Topics: A+ Carpet Cleaning, and Web Design Virginia Beach. cleanerdesigns.com Carpet Cleaning Websites Design, (SEO) Search Engine Optimization .. It is hosted by Theplanet.com Internet Services Inc (Texas, Houston,) using Apache web server. It has 2 DNS records, ns2340.hostgator.com, and ns2339.hostgator.com. The site is programmed for PHP/5.2.17. PING (174.121.10.218) 56(84) bytes of data.